"Woodley's Joinery have provided high quality craftmanship for more than 100 years throughout East Devon"
When we view the new Exmouth Life Boat Station with its clean lines and simple elegance, it is immediately apparent that this unique building will withstand the severe tests of the coastal elements for the 100 years required in the brief of the RNLI. With a striking combination of Iroko hard wood, Red cedar and Stone, the new Life Boat Station in Exmouth looks stunning and stands proud with an air of dominance and class. Built to withstand the most adverse weather conditions this particular stretch of coastline can throw at it, the professional joiners at Woodleys involved in creating this new building show an unstandable satisfaction and pride in the quality of their workmanship in this fine building. The brief Woodleys received from the RNLI was that this new lifeboat station should stand up to the worst of the elements for at least a century of regular use, and the consensus of opinion is that this beautiful building will surpass that goat. Expert joiners at Woodley's were responsible for constructing the Iroko wood frame for the building as well as the windows and the beautiful doors worked with the architect, building to his concept and ensuring the finished products were built to the highest standards. The RNLI as befits an organisation almost two centuries old are committed to the long term, and Woodleys were chosen for their dedication to excellence and craftsmanship. In fact Woodleys were chosen because of their reputation for conscientiousness going back almost a century in East Devon. Eli Wheaton began the business in Newton Poppleford back in 1920 which was continued by his son-in-law Jack Woodley. The site where Eli worked for over thirty years is where the factory now stands. It is from these traditional beginnings that Woodley’s heritage grew, passing the dedication to craftsmanship on to each generation of new joiners. 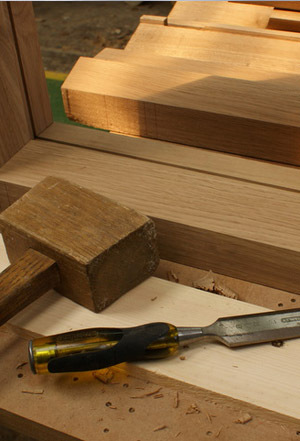 Through the tradition of first class training Woodley's can be seen to actively invest in the local community, training apprentices year upon year to continue the fantastic craft of joinery. "Woodley's Joinery are responsible for the Iroko wood frame, windows and the beautiful fortress like doors of the Exmouth Life Boat Station"
Woodley's specialist joinery workshop and experienced and knowledgeable team that we see today is built upon many years' of dedication to the industry and long may it continue for many more years to come. Confidently working in partnership with architects and quality builders to produce custom crafted results is common practice. Woodley's wealth of experience not only provides reassurance to new clients but gives them credibility, too which helps to further reinforce their longstanding reputation amongst homeowners throughout the local area. See what customers have to say about Woodley's range of Joinery services in Devon by reading a selection of glowing testimonials. 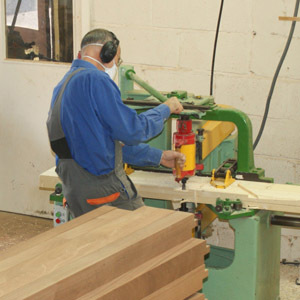 In addition to their well established reputation as competant craftsmen across East Devon, Woodleys have shone in delivering joinery services to the commericial sector. The attention to detail showing in the excellent work done in larger jobs and specialised projects. "Supplying Devon and the South West with quality joinery"
Boasting an extensive range of recently completed projects, Woodley's have extensive experience in all aspects of joinery. Work includes the production of bespoke stairways, windows, doors and frames, gates and wooden conservatories. The long standing and experienced team have been working with discerning clients across the decades very successfully, building on a reputation of excellence and quality. Almost a century of experience & heritage. For more information call now 01395 548 303 to speak with one of our experienced joiners. "High quality value for money joinery"